(+) Artemisinin is a sesquiterpene endoperoxide lactone with an unprecedented structure is a natural medicine for the treatment of malaria in particular drug against drug resistant malaria and cerebral malaria. 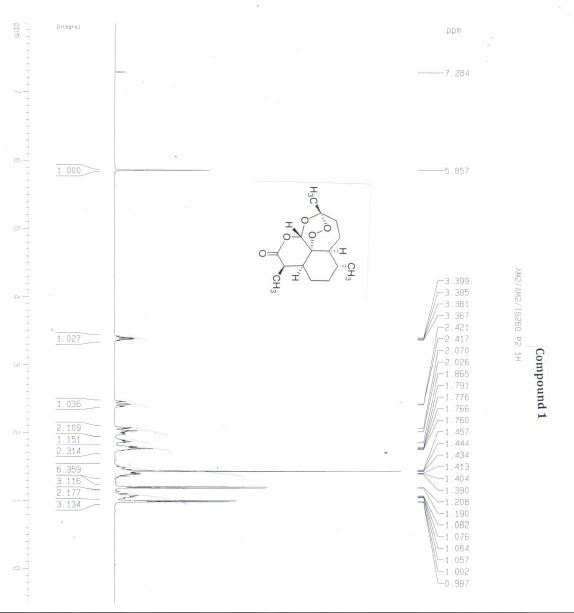 The total synthesis of this novel sesquiterpene is described using an intermolecular radical reaction on important intermediate iodolactone starting from terpene (+) isolimonene. Malaria is probably as old as mankind and continues to affect millions of people throughout the world. Today some 500 million people in Africa, India, South East Asia and South America are exposed to endemic malaria and it is estimated to cause two and half million deaths annually, one million of which are children. Certainly malaria is a serious problem all over the globe. As a consequence, effective therapeutic agents against malaria are continuously being sought, especially against those strains of Plasmodium falciparum, which are resistant to conventional quinine and acridine based drugs. Artemisinin, which has been isolated from Artemisia Annua L. Compositae (Qinghao), is an active constituent of traditional Chinese herbal medicine which is used for the treatment of malaria in China for more than 1000 years. 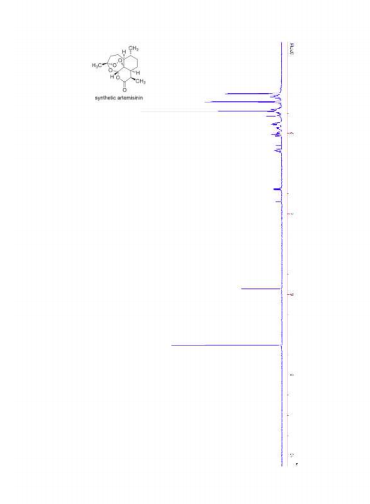 a sesquiterpene endoperoxide lactone with an unprecedented structure is a natural medicine for the treatment of malaria, in particular drug against drug resistant and cerebral malaria. 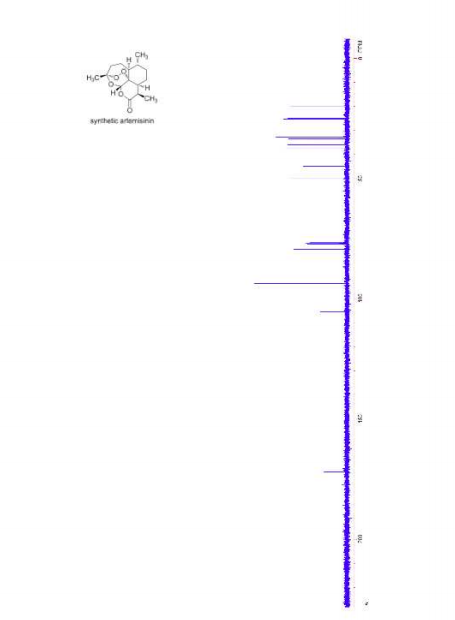 The exceptional pharmacological potential and extreme scarcity of the natural material together with its complex structure prompted us to study the total synthesis of (+) Artemisinin. The architectural complexity is attributed to the presence of 7 chiral centers with tetracyclic framework with an endoperoxide unit. Though many valuable contributions5-9 have been made towards the total synthesis of this unique structurally complex molecule, the need for a simple strategic route still remains, encouraging us to take up the total synthesis of this potent antimalarial drug. Schimid, G.; Hofheinz, W. J. Am. Chem. Soc. 1983, 105, 624. 6. Xu, X. X.; Zhu, J.; Huang, D. Z.; Zhou, W. S. Tetrahedron 1986, 42, 819. 7. (a) Avery, M. A.; Chong, W. K. M.; White, C. J. J. Am. Chem. Soc. 1992, 114, 974. (b) Avery, M. A.; White, C. J.; Chong, W. K. M. Tetrahedron Lett. 1987, 28, 4629. 8. Ravindranathan, T.; Kumar, M. A.; Menon, R. B.; Hiremath, S. V. Tetrahedron Lett. 1990, 31, 755. 9. Liu, H. J.; Yeh, W. L.; Chew, S. Y. Tetrahedron Lett. 1993, 34, 4435.
purified on preparative TLC (eluent petroleum ether/ethyl acetate, 90/10) to give 1 (6 mg) in 10% yield. 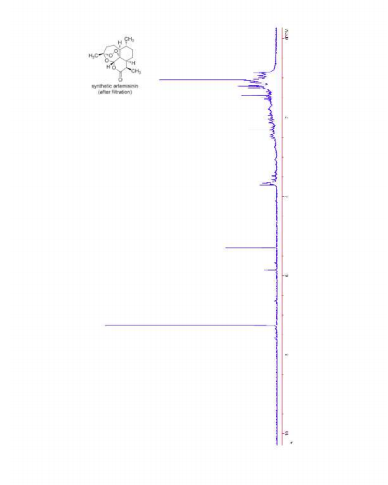 1 H NMR (500MHz, CDCl3): δ 1.00 (d, J = 6.0 Hz, 3H), 1.01-1.13 (m, 2H), 1.21 (d, J = 7.4 Hz, 3H), 1.34-1.43 (m, 3H), 1.44 (s, 3H), 1.74-1.79 (m, 2H), 1.86-1.90 (m, 1H), 1.97-2.07 (m, 2H), 2.40-2.46 (qxd, J = 3.8, 8.9 Hz, 1H), 3.36-3.41 (qxd, J = 1.7, 5.3, 5.4 Hz, 1H), 5.84 (s, 1H). MS (FAB): m/z 283 (M+1). IR (KBr): 1740 (δ-lactone) cm-1. Optical rotation [α]D : (+) 87.94 (c=0.1, Dioxane). 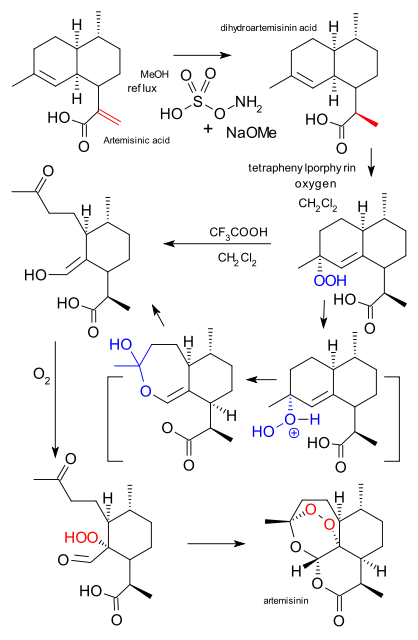 Produce artemisinin with biosynthesis and chemical synthesis. The World Health Organization estimates that in 2010 there were >200 million cases of malaria worldwide that accounted for >650,000 deaths. Many promising strategies to combat malaria require use of artemisinin-based combination therapies, but artemisinin production—from natural sources or laboratory biosynthesis—is insufficient and expensive. C. J. Paddon and J. D. Newman at Amyris (Emeryville, CA) and almost 50 colleagues in the United States, Canada, and China engineered a new strain ofSaccharomyces cerevisiae (baker’s yeast) to improve the production of artemisinic acid (1, a precursor for artemisinin) from glucose. This research was sponsored by the Institute for OneWorld Health with the support of the Bill & Melinda Gates Foundation. The authors studied the biochemical pathway to 1 in S. cerevisiae. They then overexpressed the genes involved in artemisinin production and suppressed those related to other products. They also added isopropyl myristate oil to solubilize 1 and drive the equilibrium toward the product. They produced 1 in 25 g/L concentration. in the last step, the use of air, a safer and less expensive source of triplet oxygen (3O2) than pure oxygen. Friedrich Wöhler’s early syntheses of oxalic acid and urea heralded the age of synthetic organic chemistry. These reactions demonstrated the potential for man to generate compounds that had previously only been obtained from the extraction of biological substances. Remarkably, despite huge advances in chemical synthesis, almost all natural products synthesised to date have relied upon similar apparatus and techniques to those used by Wöhler in the 1820s. Steve Ley and his group are among the pioneers of the use of flow chemistry in synthesis, and have demonstrated the use of machines in place of the antiquated round-bottomed flasks still used in chemistry labs the world over. The number of sequential operations required in traditional approaches to making molecules can make synthesis time-consuming. In particular, downstream processes such as purification of the desired compound from waste products can take much longer than the actual reaction. Importantly, flow chemistry can also offer significant improvements to work health and safety as hazardous chemicals can be manipulated in a closed system and therefore, risks associated with exposure are reduced. In flow chemistry (at its most basic), a reaction is performed in a continuous flowing stream where substrates and reagents are combined inside inert tubing and pumped around a coil of tubing before being quenched or treated with the chemical required for the next stage of the transformation. Ley and coworkers have recently published a review that presents some highlights from the use of flow chemistry in natural product synthesis. One of the notable examples featured in this review is the continuous flow, semi-synthesis of artemisinin bySeeberger and Lévesque. Artemisinin is a sesquiterpene that represents the frontline treatment for plasmodium falciparummalaria when used in combination with other therapeutics. The supply of artemisinin from natural sources is problematic as is the scalability of existing synthetic approaches. Dihydroartemisinic acid 2, (derived from artemesinic acid 1) represents the starting point for this flow synthesis and first undergoes photooxidation to yield hydroperoxide 3. Subsequent treatment of 3 with strong acid, followed by oxidation provided hydroperoxide 5, which underwent a spontaneous cycloaddition sequence, leading to the generation of artemisinin6. The use of a continuous flow reactor particularly enhanced the challenging photochemical transformations associated with the synthesis. Issues such as low mass transfer of oxygen gas into solution and low penetration of light were resolved by coiling the reaction tubing around a lamp to enabled effective generation of the singlet-oxygen required for the reaction. Additionally, improved mixing and temperature control could also be achieved. Crucially, this synthesis provides a low cost method to meet the escalating demand for artemisinin at affordable prices for patients in the developing world. The elegant syntheses described in this review span a range of natural product classes and highlight the advantages that mechanisation of chemical processes can offer. As chemists seek to address medicinal and environmental challenges, perhaps greater emphasis should be placed on rational design rather than labour-intensive and repetitive tasks. The effective implementation of flow systems and technology could revolutionise the chemical sciences, and this review provides some exciting food for thought. Although photocatalytic chemistry has been the subject of intense interest recently, the rate of these reactions is often slow due to the limited penetration of light into typical reaction media. Peter H. Seeberger at the Max-Planck Institute for Colloids and Surfaces in Potsdam and the Free University of Berlin showed (Chem. Sci. 2012, 3, 1612. DOI: 10.1039/C2SC01016J) that Ru(bpy)32+ catalyzed reactions such as the reduction of azide 1 to 2 can be achieved in as little as 1 min residence time using continuous flow, as opposed to the 2 h batch reaction time previously reported. The benefits of flow on a number of strategic photocatalytic reactions, including the coupling of 3 and 4 to produce 5, was also demonstrated (Angew. Chem. Int. Ed. 2012, 51, 4144. DOI: 10.1002/anie.201200961) by Corey R. J. Stephenson at Boston University and Timothy F. Jamison at MIT. In this case, a reaction throughput of 0.914 mmol/h compares favorably with 0.327 mmol/h for the batch reaction. ACTs (Artemisinin) drugs to treat malaria . Earlier this year Francois Levesque and Peter Seeberger laid out their plans for scaling up the production of the important anti-malarial drug artemisinin (DOI). Their vision: the industrial production from dihydroartemisinic acid in a single continuous flow reaction. This month in Science, science writer Kai Kupferschmidt is not so sure. Current artemisinin industrial production completely relies on extraction from thesweet wormwood plant. But help is on the way. Biotech company Amyris has trained special yeast cells to produce a precursor called artemisinic acid. The dihydro acid can then be obtained from artemisinic acid via reduction with hydroxylamine-O-sulfonic acid / MeOH (diazene). In the Levesque/Seeberger procedure the next step to artemisinin is a photochemical reaction with singlet oxygen forming a hydroperoxide using teraphenylporphyrin asphotosensitizer followed by an ene reaction. This step is then followed by a thermal Hock rearrangement initiated by trifluoroacetic acid. 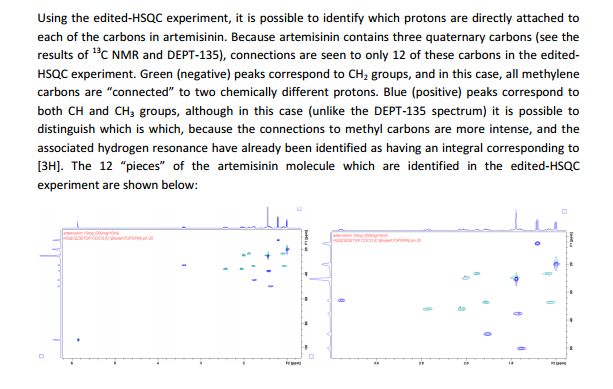 Another round of oxygen adds another hydroperoxide unit and another rearrangement forms artemisinin itself. This sequence takes place in a continuous flow reactor and in the photochemical step all the tubing is wrapped around the lamp for maximum exposure to light. As reported back in 2012 here chemical company Sanofi and the Bill and Melinda Gates Foundation have joined forces (Sanofi the know-how and Bill the money) to increase production of the important antimalarial drugartemisinin. In a recent OPRD publication Sanofi chemists present a commercial-scale (no-loss no profit) production line with a capacity of 60 tonnes, starting from yeast-produced artemisinic acid. Here is the summary. In step one from artemisinic acid to dihydroartemisinic acid (a dehydrogenation) the Wilkinson catalyst was deemed too expensive and replaced by ruthenium chloride (R)-DTBM-Segphis (a modified segphos). Scale: 600 Kg, 90% diastereoselectivity. The compound was next activated with ethylchloroformate and potassium carbonate in dichloromethane to the anhydride. The photochemical step consisted of addingtetraphenylporphyrin as a sensitizer and trifluoroacetic acid in dichloromethane. The subsequent Schenck ene reaction / Hock rearrangement requires two equivalents of singlet oxygen. Where the prior art yielded 41% of product, this photochemical solution pushes out 55%. Side note: the article does not really explain why the acid was activated, the Seeberger procedure does not include this step. 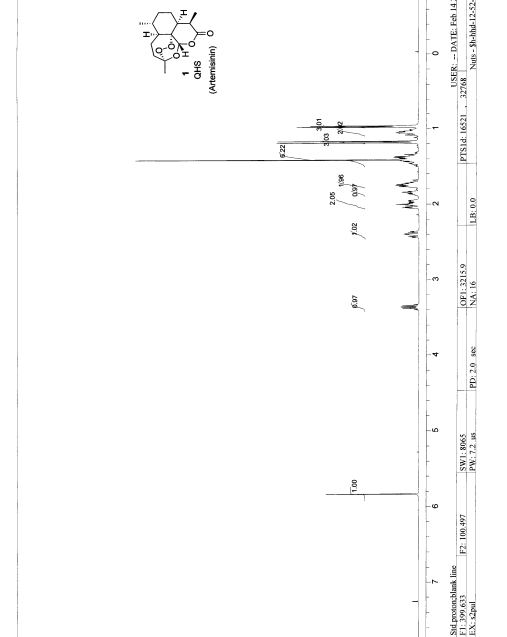 Remaining challenge: product isolation was accomplished by simultaneous DCM distillation – solvent replacement with n-heptane and crystallisation. Pretty amazing when considering this is still industrial production at the hundreds of kilogram scale and the final product is a labile peroxide! Malaria represents one of the most medically and economically debilitating diseases present in the world today. Fortunately, there exists a highly effective treatment based on the natural product artemisinin. Despite the development of several synthetic approaches to the natural product, a streamlined synthesis that utilizes low-cost chemical inputs has yet to materialize. Here we report an efficient, cost-effective approach to artemisinin. Key to the success of the strategy was the development of mild, complexity-building reaction cascades that allowed the use of readily available, affordable cyclohexenone as the key starting material. Rf = 0.2 (hexanes/ethyl acetate, 5/1). 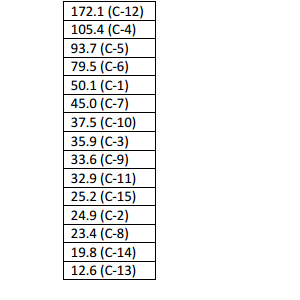 IR (film) ν/cm-1 2956 (m), 2933 (m), 2884 (m), 2861 (m), 1739 (s), 1201 (m), 1114 (s), 1033 (m), 1028 (m), 995 (s), 883 (m). [α]D 20 = +64.0 (c 1.20, CHCl3) (nat. [α]D 20 = +66.6 (c 0.90, CHCl3)). 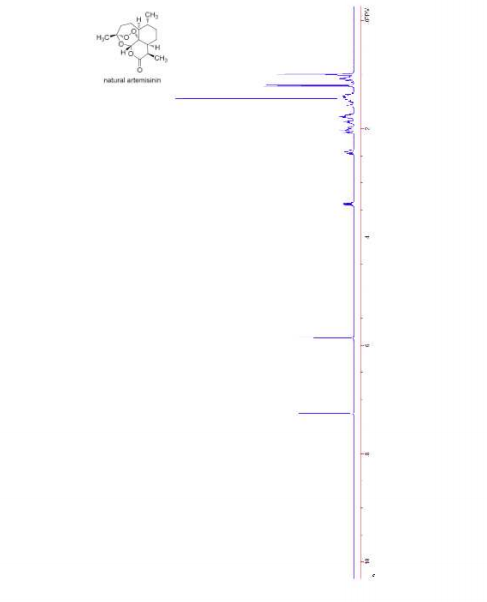 1H NMR (400 MHz, CDCl3) δ 5.84 (s, 1H), 3.38 (dq, J = 7.4, 5.5 Hz, 1H), 2.41 (ddd, J = 14.4, 12.9, 3.9 Hz, 1H), 2.06-1.92 (m, 2H), 1.90-1.82 (m, 1H), 1.79-1.70 (m, 2H), 1.52-1.31 (m, 3H), 1.42 (s, 3H), 1.18 (d, J = 7.4 Hz, 3H), 1.10-1.00 (m, 2H), 0.98 (d, J = 5.9 Hz, 3H). 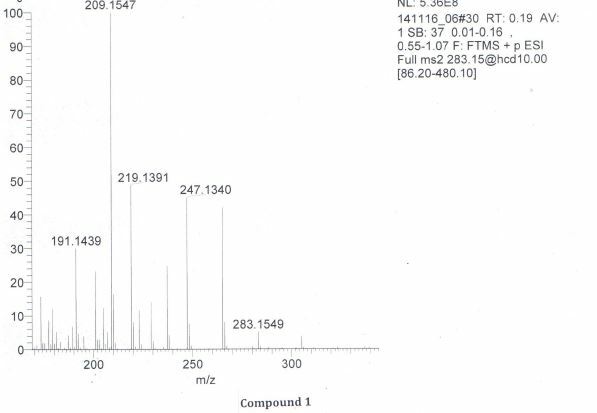 13C NMR (100 MHz, CDCl3) δ 172.7, 106.0, 94.3, 80.1, 50.7, 45.6, 38.2, 36.5, 34.2, 33.5, 25.8, 25.5, 24.0, 20.5, 13.2. HRMS calcd. for C15H22O5Na [M+ Na] 305.1365, found 305.1356. A new commercial-scale alternative manufacturing process to produce a complementary source of artemisinin to supplement the plant-derived supply is described by conversion of biosynthetic artemisinic acid into semisynthetic artemisinin using diastereoselective hydrogenation and photooxidation as pivotal steps. This process was accepted by Prequalification of Medicines Programme (PQP) in 2013 as a first source of nonplant-derived-artemisinin in industrial scale from Sanofi production facility in Garessio, Italy. Optical Rotation: [α]20D = +74–78 [10 mg/mL in ethanol]. The melting point of the crystalline artemisinin was found to be about 159 °C. *Email: a.lapkin@warwick.ac.uk. Fax: (+44) 24764 18922. This article is part of the Continuous Processes 2012 special issue. Stoichiometric reduction of artemisinin to dihydroartemisinin (DHA) has been successfully transferred from batch to continuous flow conditions with a significant increase in productivity and an increase in selectivity. The DHA space-time-yield of up to 1.6 kg h–1 L–1 was attained which represents a 42 times increase in throughput compared to that of conventional batch process. (+)-Artemisinin (41) is currently the most effective drug against Plasmodium falciparum malaria as part of an artemisinin-based combination therapy (ACT). 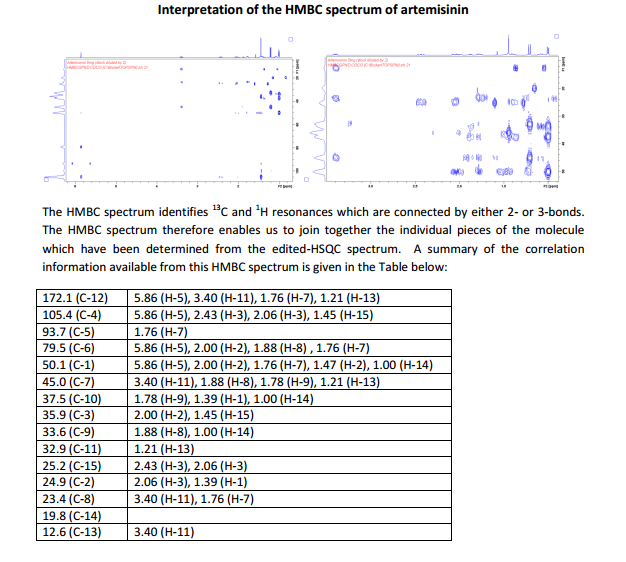 Although it can be isolated on an industrial scale from Artemisia annua, the market price of artemisinin (41) has fluctuated widely and traditional extraction does not provide enough material to meet the worldwide demand. 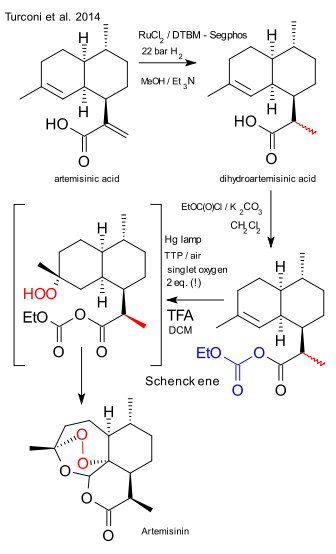 Interestingly, recent efforts towards a cheaper and more efficient production of artemisinin (41) have mainly taken place in the areas of synthetic biology, semisynthesis and plant engineering, while there has been a lack of practical approaches using a straightforward total synthesis. Despite the fact that all the total syntheses of artemisinin, until 2010, were impressive from a feasibility point of view, none of them provided a solution for the low-cost synthesis of 41. This changed when Cook’s group recently published a scalable synthesis of artemisinin (41), which provides a blueprint for the cost-effective production of 41 and its derivatives below Key to their successful strategy was the use of reaction cascades that rapidly built complexity, starting from the cheap feedstock chemical, cyclohexenone (42). The latter was first subjected to a one-pot conjugate addition/alkylation sequence, to give ketone 43. 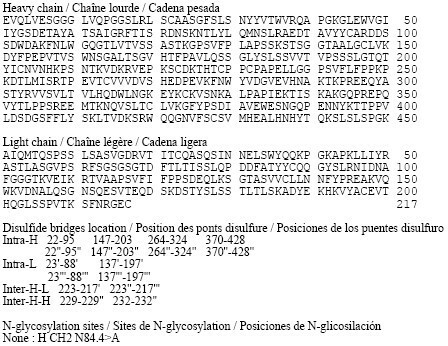 A three-step sequence consisting of formylation, cycloaddition and a Wacker-type oxidation, yielded 9.4 g of methyl ketone 44. The challenging formation of the unusual peroxide bridge was initially met with failure, but was eventually realized by a reaction with singlet oxygen to give 41 amongst other oxidized intermediates. 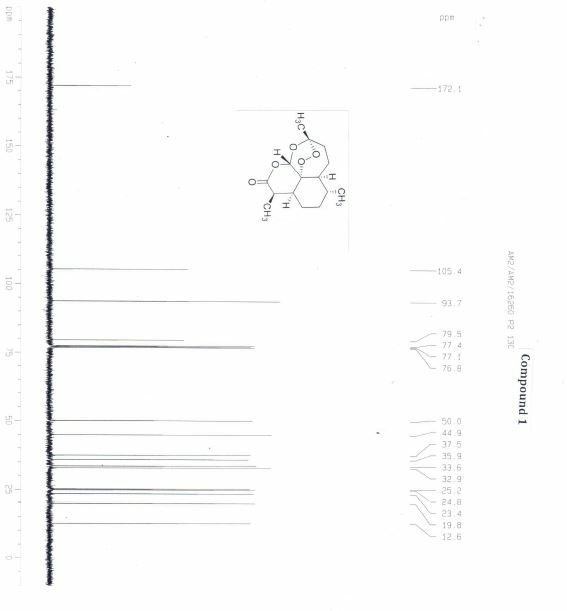 The entire synthetic sequence was conducted on a gram scale, required only three chromatographic purifications and was carried out in only five flasks. Considering the low cost of the commodity chemicals used and the conciseness of Cook’s synthesis, it is certainly worth being further investigated. Attachment of H2O2 onto the highly hindered quaternary C-12a in an advanced qinghaosu (artemisinin) precursor has been achieved through a facile perhydrolysis of a spiro epoxy ring with the aid of a previously unknown molybdenum species without involving any special equipment or complicated operations. The resultant β-hydroxyhydroperoxide can be further elaborated into qinghaosu, illustrating an entry fundamentally different from the existing ones to this outstanding natural product of great importance in malaria chemotherapy. QHS: M.p. 153-155 ºC (nat. m.p. 154-156 ºC). [α]D 25 +67.6 (c 1.75, CHCl3), (nat. [α]D 24 +66.6 (c 1.57, CHCl3)). 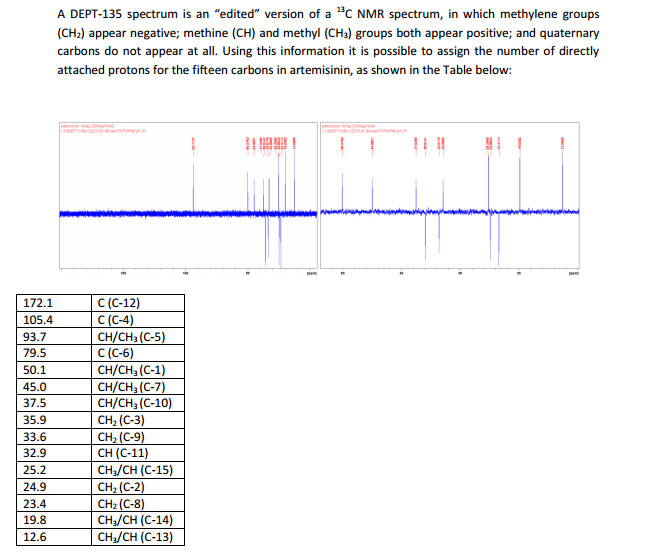 13C NMR (100 MHz, CDCl3) δ 171.9, 105.3, 93.6, 79.4, 49.9, 44.8, 37.4, 35.8, 33.5, 32.8, 25.1, 24.7, 23.3, 19.7, 12.4. FT-IR (film) 2959, 2933, 2884, 2861, 1738, 1450, 1378, 1212, 1201, 1114, 1033, 997, 882, 831 cm–1. 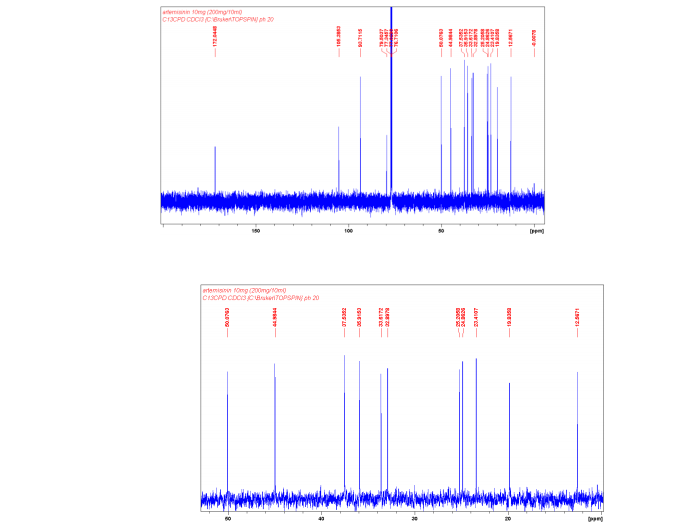 ESI-MS 283.1 ([M+H]+ ), 305.0 ([M+Na]+ ), 337.0 ([M+MeOH+Na]+ ); EI-HRMS: calcd for C15H22O5 (M+ ) 282.1467, found 282.1461. *Tel. : +45 6550 7481. E-mail: bgr@kbm.sdu.dk. A systematic method of conceptual process synthesis for recovery of natural products from their biological sources is presented. This methodology divides the task into two major subtasks namely, isolation of target compound from a chemically complex solid matrix of biological source (crude extract) and purification of target compound(s) from the crude extract. Process analytical technology (PAT) is used in each step to understand the nature of material systems and separation characteristics of each separation method. In the present work, this methodology is applied to generate process flow sheet for recovery of artemisinin from the plant Artemisia annua (A. annua). 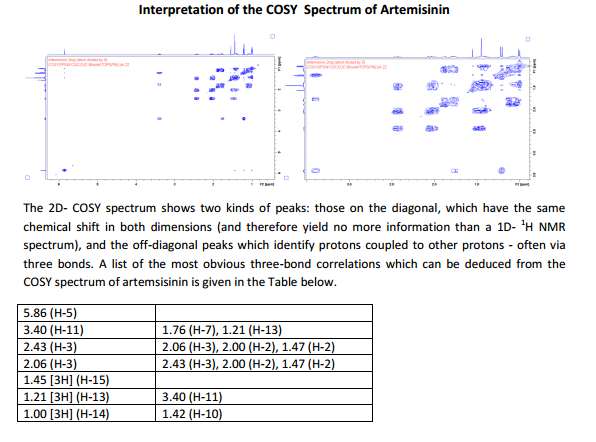 The process flow sheet is evaluated on the basis of yield and purity of artemisinin obtained in bench scale experiments. Yields of artemisinin obtained in individual unit operations of maceration, flash column chromatography, and crystallization are 90.0%, 87.1% and 47.6%, respectively. Results showed that the crystallization step is dominant to the overall yield of the process which was 37.3%. 53 Monographs for pharmaceutical substances (A–O). The International Pharmacopoeia, 4th ed. Vol. 1; World Health Organization: Geneva, 2006. 54.Monographs for pharmaceutical substances (A–O). The International Pharmacopoeia, 6th ed. ; World Health Organization: Geneva, 2016. The development of a cost-effective process for the production of artemisinin, the precursor of all artemisinin-derived drugs, the first-line treatment for malaria, has been a long-pursued endeavor. The breakthrough achievement of coaxing genetically engineered yeast to express Artemisia annua genes for the commercial production of artemisinic acid, an advanced intermediate in the synthesis of artemisinin, has yet to fully realize an affordable malaria treatment for the poor because of the lack of a cost-effective chemical conversion into artemisinin. We describe herein a commercially feasible and pragmatic synthesis of artemisinin from amorpha-4,11-diene, an early-stage intermediate produced in 2-fold higher molar yield than engineered yeast cells can process into artemisinic acid. 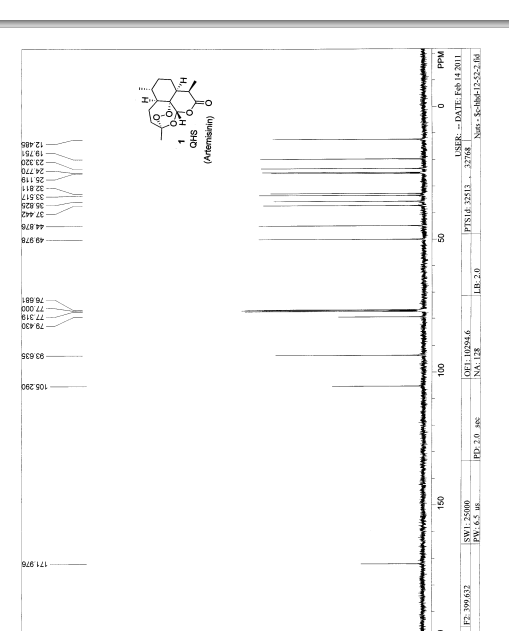 The key to this novel approach is an exceedingly effective functionalization of the isopropenyl group of amorphadiene via endo-epoxyamorphadiene to give dihydroartemisinic acid, which upon esterification followed by oxidation and cyclicization furnishes pure artemisinin in approximately 60% yield. By DR ANTHONY MELVIN CRASTO Ph.D in Uncategorized on September 18, 2015 .